Students of our Advanced Greek language Malvern campus presented to both parents and friends of the school the theatrical project titled “Always remember”. The majority of students involved in the project are the children of recently arrived migrants from Greece, who with the assistance of director and actor Stathis Grapsas, have worked extensively on the issue of migration and the experiences they encounter in their “new home land”. 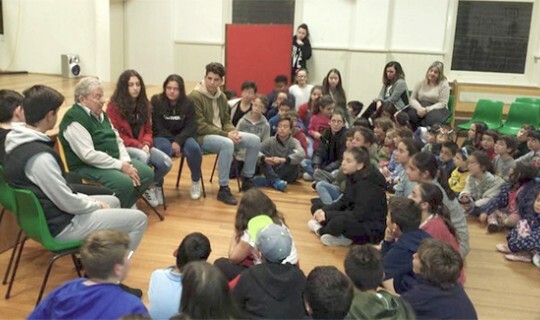 They recalled, discussed and articulated their memories of Greece, their school experiences, friendships, villages, grandfathers and grandmothers. All these experiences were presented throughout the presentation, with ample humour and elements of nostalgia. Joining this unique presentation was Mr. Nikos Galanopoulos, a resident of Fronditha Care, who spoke about his own memories and discussed with the students the associated similarities, differences and personal concerns. This exceptional initiative - conceptualised by Stathis Grapsas – provided our students with the unique opportunity to delve into a topic that is every so relevant in today’s global world.